135° rotation / 45° discharge angle. 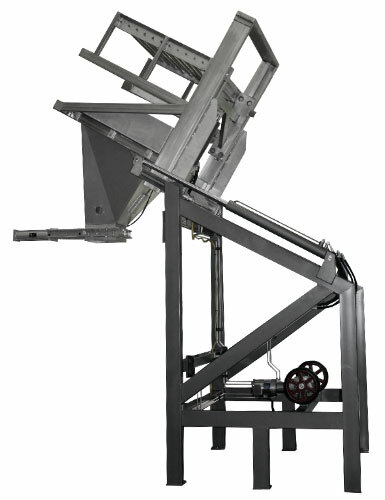 MTS exclusive pivot cylinder design requires less ceiling height. 304 stainless steel tubular frame with continuous welds, welds passivated. 304-2b stainless steel on product contact with continuous TIG welds. Stainless steel tube bottom on skip allows debris to fall through. 6″ diameter Ergo GT low rolling resistance casters with brakes. East to clean polycarbonate safety guarding with stainless steel tubular frames on two (2) sides of the unit. Allen-Bradley “Zero-Force” touch button requires that operator use both hands to operate unit. Electrical controls designed for integration with customer’s existing plant control system. Remote 5 HP/5 GPM Parker hydraulic system with MTS exclusive two-speed circuit for a smooth, controlled rotation. WHY CHOOSE MTS CONTAINER DISCHARGERS? Responsive service before and after the sale. Custom designed and engineered with your specific application in mind. The heaviest construction in the industry.